Hey Guys - Ish here, request Gundam Music of the Week please its more fun if its a collaborative team effort! Okay this was the episode I was expecting last week and now all the build up and exposition makes a lot more sense. In many ways Episodes 11 and 12 seem to be two halves of one whole and watching one alone leaves you feeling kinda empty but seeing both together gives you a sense of completion as one was exposition and the other was action split only due to time constraints. Taking that into account I’m starting to have a much higher opinion of last weeks episode which you can find my write up for here along with the tags. With that being said this episode hit a home run in terms of action. If fans were feeling Iron-Blooded Orphans was kind of slowing down this episode should absolve them of those fears. This episode was fast, fun, and exciting if a little empty, basically the bacon of Gundam lots of sizzle little substance but great at the time. What was interesting though is this episode did not go the way I expected and I loved it for it many of my predictions from last week were so far off the mark its kind of funny. Anyways lets move on into “The Shoals”. As always we pick up right where we left off, this time in the conversation with Orga and Naze. Naze complaining that small fry have attacked them with Orga responding that Tekkadon and the Turbines will show them as Orga can’t let Tekkadon be looked down up. This shows another aspect of Orga’s leadership style knowing often reputation is as important as arms itself in battle. Orga feels (and Naze concurs) that they must beat the Brewers decisively less they be seen as weak and more formidable sharks start to circle. From there the Tekkadon plans out the confrontation. They will sail to an area of space littered with Mobile Suit debris from the Calamity War 300 years ago. However due to the gravitational output of the Ahab reactors (another interesting piece of information) still functioning in the area there is a sort of pathway which ships can travel. However due to the scrap metal in the area long range communications and sensors are jammed. In short its up to the skills of the pilot to navigate the area as you are sailing blind. Over on the Brewers ship the Human Debris are discussing life, death, and rebirth with the subtext death is hope for escape. Of course during this Kudal Cadel (ya that’s his name...) comes in and breaks everything up effectively implying there is no escape for them as they’re merely subhuman trash. However he of course still needs them to pilot the suits for the upcoming battle. With all the pieces in place Lafter and Mikazuki are sent out ahead as forward reconnaissance scouts to help navigate the debris field. Soon after they’re attacked by the Brewers mobile suits who quickly engage. At first it seems that Lafter and Mikazuki are at a disadvantage due to the inability to maneuver however the tide is quickly turned as the Hammerhead and Isaribi breaks through the debris field and flanks the Brewers ship. The Hammerhead true to its name rams the capital ship with the Isaribi engaging with grappling hooks setting up a boarding party into the enemy ship. Back in the battle with the confusion of the surprise assault and the introduction of the Teiwaz mobile suits Mikazuki quickly makes quick work of almost all the Human debris pilots, almost as quickly my prediction of them being a mid-season bosses goes up in an almost comically quick fashion as well. With the action picking up Akihiro launches in his Graze looking for Mashihiro one of the few remaining survivors of Mikazuki’s massacre. Finding his brother the two engage shortly however they quickly stop and exchange words. Losing the fight against the much more mobile Mikazuki Cadel looks for some way of dealing with the overwhelming threat chasing him down. Finding the few mobile suits still standing he decides its best to take Akihiro “hostage” in a similar plan from last episodes aborted battle. 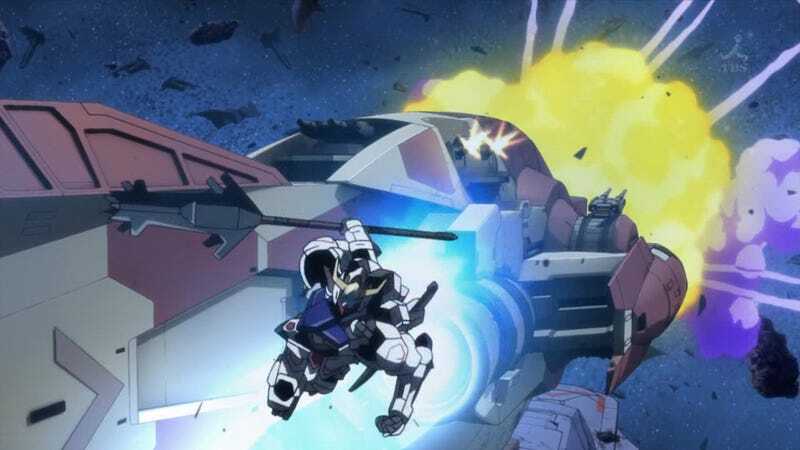 However Mashihiro has other plans deciding the best way to punish Akihiro he lets himself get smashed by his allies Gundam right before Akihiro’s heartbroken eyes ending the episode. As I said above this was an episode where a lot of unexpected things happened for me. The first is basically the complete destruction of the Brewers offensive capabilities including basically every pilot. Considering they had a bit of character development especially the revenge motive it was surprising to see them die so early. However it was refreshing as the writers used my expectation against me making their quick deaths actually surprising and most importantly exciting. Furthermore the death of Mashahiro before Akihiro’s eyes wasn’t super surprising except for the fact I expected Akihiro to die. As we’re now 12 episodes in halfway through the series and a main character has yet to bite the bullet. Finally I want to reiterate my belief this will be a two season show akin to Gundam OO. We’re now 12 episodes in literally half way and had an episode entirely devoted to an awesome space battle, with almost no movement on the main plot. Furthermore we’ve only seen two of the three confirmed Gundams in the series. Am I crazy or is this world too expansive and the plot too broad to be finished in 12 more episodes? We shall see but I’m hyped to see what comes next. Until next week! Gundam Music of the Week: Years ago when I was getting back into anime I stumbled upon a series that had taken my favorites animes time slot and that was Gundam OO. Having not watched a Gundam since SEED aired on YTV here in Canada I was entranced by the plot and the beauty of the animation (I still consider it the most beautiful Gundam) and my love of the franchise burned bright again; so when ValleySwag requested a Gundam OO song it was a simple choice “sure - why not”. “Wana” Gundam OO’s initial ending although not as immediately grabbing as their Openings is a song that grows on you and overtime really stays in your head. I hope you like it too.